BURTON, Sir Richard Francis. To The Gold Coast For Gold. A Personal Narrative. 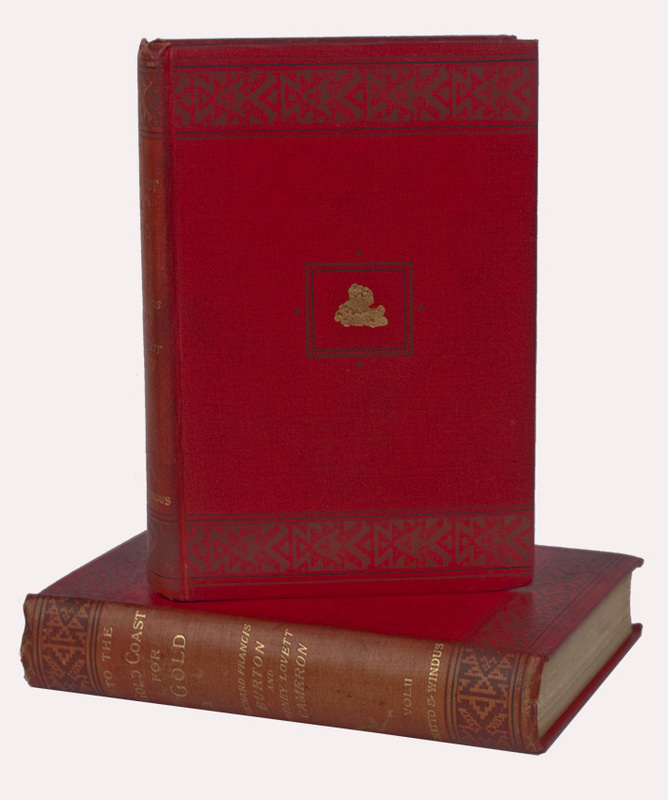 London: Chatto & Windus , 1883. First edition. Two octavo volumes (7 7/16 x 4 15/16 inches; 189 x 126 mm). xii, [1, contents], [1, blank], -354,[2,], [32, publisher's advertisements]; [2, blank], [i]-vi, -381,  pp. With two colored folding maps in volume I and a colored frontispiece in volume II. Publisher's original red cloth, stamped in black and gilt on boards. Spines lettered in gilt and stamped in black. Black-coated endpapers. Spines slightly rubbed and sunned. Top edges a bit foxed. Minimal and invisible restoration to inner hinges. Bookplate on front paste-down of each volume, of previous owner John Ralph Willis, a prominent collector of Rare Africana. Each volume with previous owner's ink signature and date of 1888 on front free endpapers. On the same page in the same hand is written "Valley Forge Historical Society & Washington Memorial Library, Valley Forge." A very good and handsome set. 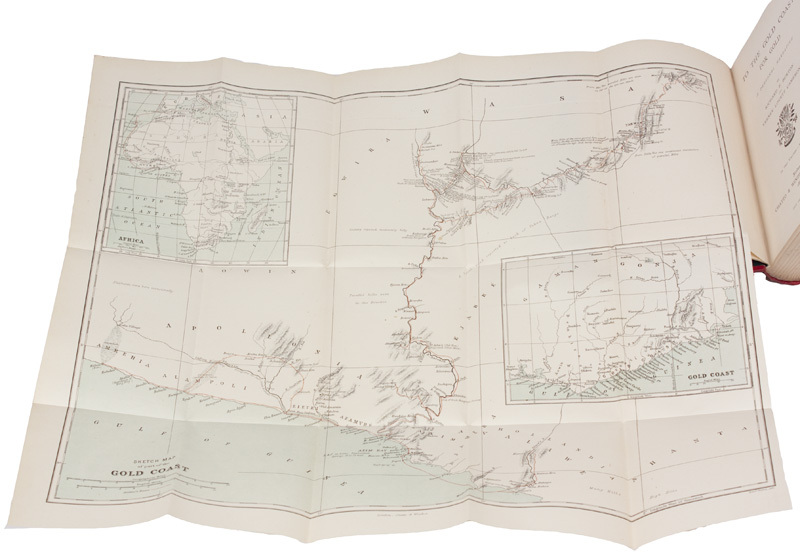 "In 1881–2, Cameron joined Burton on a mission to West Africa. The two explorers examined the interior of the Gold Coast, searching for evidence of its gold-producing potential. Cameron also plotted the course of the Ankobrah River, and together they sent back to Kew 151 plants native to the Gold Coast. In 1883 their book To the Gold Coast for Gold was published..." (Oxford Dictionary of National Biography).